We’ve been having a lot of fun playing with the dyed rice I made a few weeks ago. When I first made it Rosalie kept wanting to eat it so I just put some in a bottle to make a shaker, but when I tried again on Friday she seemed keen to explore the texture. At first I simply had the box of rice on a tray, but this didn’t really contain the rice fallout. So I dug a large plastic storage box out of the cupboard and sat Rosalie and the box of rice inside that. This did the trick! Along with the coloured rice, in the box I included a small scoop, a baby fork and a little pot, so that she could scoop and pour. She mostly enjoyed feeling the rice run through her fingers and the sound of the grains against the plastic. We also talked about the different colours, which she was probably too small to understand or appreciate! You can read my how-to on dying rice here – it’s really simple! Give it a go! I love how simple this is 🙂 and how you contain the mess! LOL I love that you put R in the tub with the rice! I would totally have done the same as I can't bear the thought of having to pick hundreds of rice grains off the floor. Ha ha, I know, the dustpan got a good workout after the tray failed to work! I know! It is quite calming running yours fingers through it and you become mesmerised by the colours! 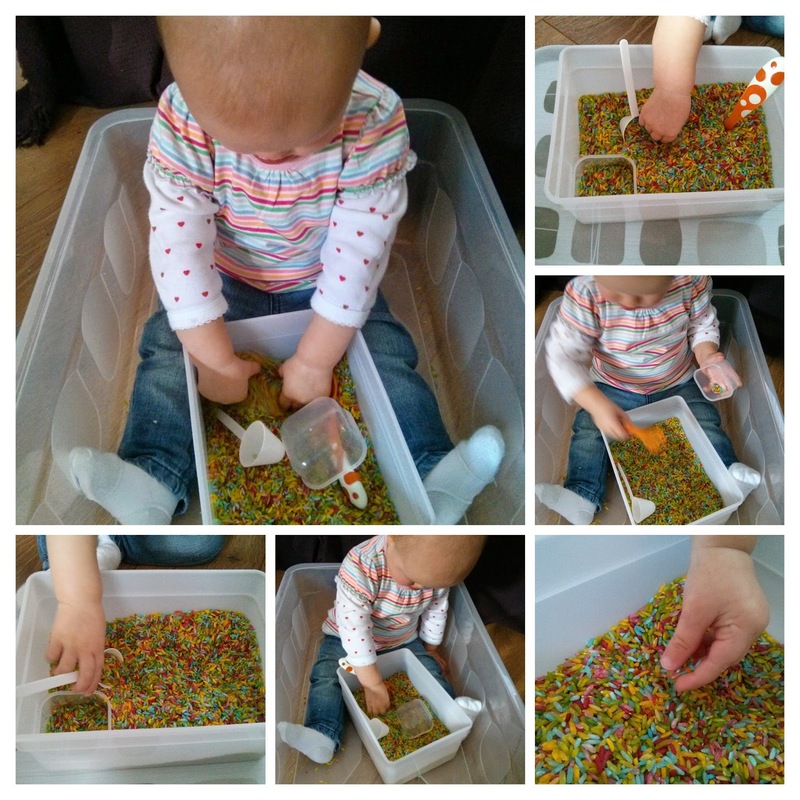 Lovely idea for some sensory fun and learning and what a great idea to sit her in a box to contain the mess!